Herald Sun... Trainer Mike Moroney also has ambitious plans after Chicharita's upset win at Ellerslie. The improving filly came from last on the turn under Chad Ormsby to take out the Group 2 Royal Stakes (2000m) from Our Famous Eve, Joy's Choice and favourite Planet Rock, who faded in the last 150m. Moroney, who operates stables in New Zealand and Melbourne, said Chicharita probably would join his Australian team, possibly as early as autumn, for the Australian Oaks in Sydney. In the more immediate future, she will stay home to be tested over 2400m in New Zealand's Oaks in March. The Royal Stakes is part of New Zealand's Filly of the Year series and Moroney, who trains Chicharita in partnership with Andrew Clarken, said he had expected her to run well. "She's a really smart filly and we had a fair bit of confidence, given the way she'd worked," Moroney said. "She's probably on target for the Oaks at Trentham." Hamilton studmaster Gordon Cunningham has had many a success in the sales ring and as a breeder. But Chicharita's never-say-day win in yesterday's Gr II $100,000 Royal Stakes (2000m) at Ellerslie broke new ground for him as an owner. "That's the greatest thrill in racing I've had in my life so far and it's something I'll always cherish," Cunningham said afterwards. Cunningham bought Sir Tristram mare Trisynd in foal to Towkay, hoping his investment might provide him with a colt to sell. But when she foaled a filly Cunningham was far from disappointed. "She had a filly I liked enough to retain and race myself and this is the result," said Cunningham, who shared the thrill of the win with his twin sons Patrick and Liam, both 12. Cunningham, who bred and races Chicharita under his personal Suncroft Bloodstock banner, sent the filly to Matamata trainers Michael Moroney and Andrew Clarken in recognition of the stable's record of buying young horses from Curraghmore Stud, the Hamilton studfarm he runs. 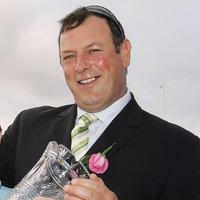 Moroney and Clarken have long had a high opinion of Chicharita and Clarken joked that Moroney had been keen on poaching the filly for his Melbourne stable. Yesterday's win was Chicharita's third from six starts and has likely earned her a start at the Gr III Desert Gold Stakes (1600m) at Trentham on January 28 ahead of a possible tilt at the Gr I New Zealand Oaks (2400m) at Trentham in March, though Moroney was not committing to anything. "She's a really smart filly. We were coming in with a fair bit of confidence on the way she worked on Tuesday," Moroney said. "Andrew's always said she's pretty good and so has Chad [Ormsby, jockey]. He has done a fair bit of work with her and thought she was up to winning a race like this, so for her to win it is great. "She'll probably go to Australia at some stage but whether it's for a race like the AJC Oaks, I don't know yet. She's well up to it. She's out of a Sir Tristram mare and a lot like Sir Tristram, and we're just grateful that Gordon gave us an opportunity with her. "I went and had a look at her as a yearling out at Gordon's and she's always impressed me as a lovely type." Moroney said the stable's other New Zealand-based Oaks filly was The Lions Rule, who has finished second twice in as many starts, the most recent at Te Rapa last month. She is now out in the paddock and will return in the autumn to prepare for the Gr I Queensland Oaks.